Bring a little fun to your children's meal time with this fun pirate glass. 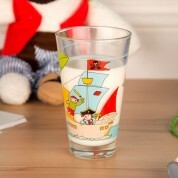 The glass features an illustration of a pirate ship, pirates, a parrot and a treasure map. Creatively designed, it is perfect to lay at the table or displayed in their bedroom. 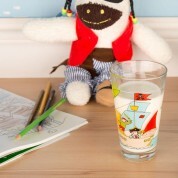 An ideal gift for adventurous little boys! Dimensions: 13cm height x 8cm width (at the widest point).